Posted on May 24, 2013	by Derek "Gamer Crash"
It’s been an interesting past year for former THQ developers going through the collapse of the publisher to being sold to companies all fighting via an auction. Add in the fact that many of these studios are currently in the middle of developing a game. Such was the life for 4A who was hard at work on Metro: Last Light, an ambitious sequel to 2033 which achieved a cult following after it’s release. Looking to improve and fix aspects that either didn’t work the first time around or wasn’t fully fleshed out, one could say that Last Light has a lot of pressure to succeed. After being picked up by Deep Silver and given an additional couple months to work on the game, Metro: Last Light is finally here. Are you ready to enter the Metro again? Last Light picks up the story from the Ranger/Dark ending of Metro 2033 and I won’t go into details of that in case you may be sensitive to spoilers. 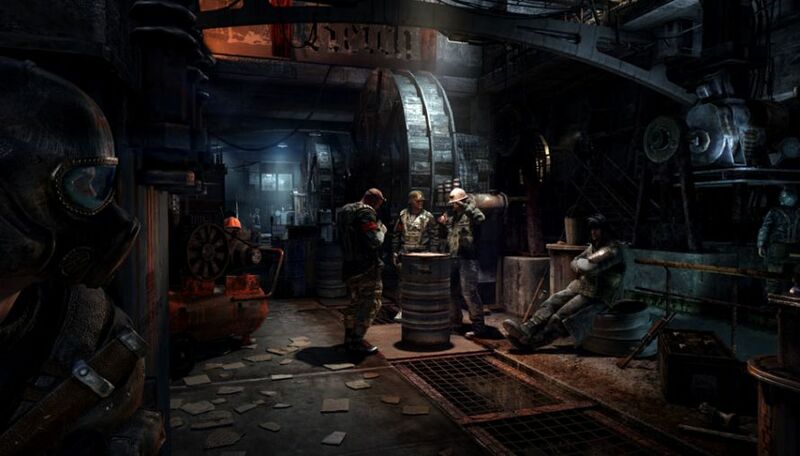 Players are back in the shoes of protagonist Artyom as life continues to turn deep in the Russian metro system. For those that are not aware, the surface has been devastated by a nuclear attack and the fragment of humanity that has survived as taken refuge in the metro system. Factions have sprung up and it appears that war is on the horizon in addition to the constant threat of the mutations and monsters that lurk just outside. The thing I absolutely love about this game is the world that 4A has created. It’s wonderfully detailed, brimming with activity and the immersion levels are just off the charts. Yes, it’s a dark and gloomy place humanity has been thrust into, but with the ambient sounds, side conversations between NPCs, and the way people behave (especially in hub towns), the world really feels alive. There have been times I sat down only intending to play for an hour but sure enough, looking at the clock after playing for what felt like minutes, hours have flown by. The game does a fantastic job pulling you into it’s world and never letting you go. It’s quite easy to get lost in. The same can be said for the atmosphere as well. Countless times, I’ve felt uneasy or tense upon entering certain areas of the metro. The catacombs in particular create a sense of terror with dark corners, skittering noises, and cobwebs. Couple that with the already heavily damaged metro stations and architecture and there’s just nothing quite like it on the market. Not only that, like the first game, you’re responsible for maintaining the filter on your gas mask when using it, charging your flashlight and night vision goggles. Forget to do that and you’ll be in trouble. These elements again lend to creating an incredibly strong immersion factor. 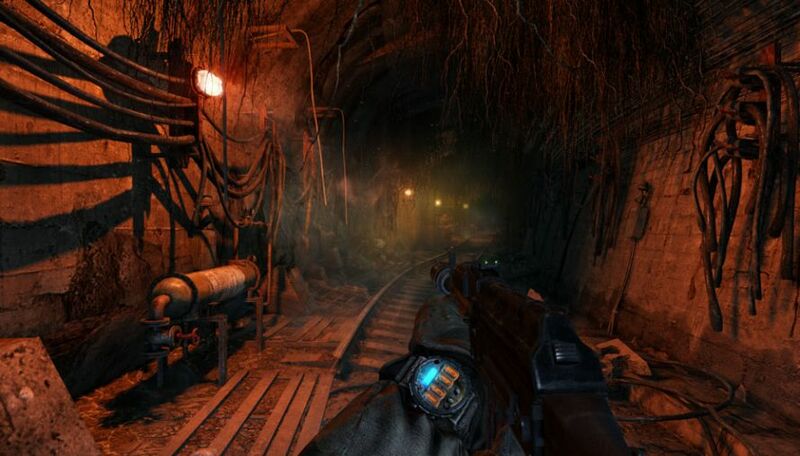 Metro: Last Light is a game that finds joy in toying with your fears as well. Gamers who have real fears of darkness, tight places, or even spiders…well…the game will prey upon you. It’ll thrust you into uncomfortable situations forcing you to confront those fears. Being someone who isn’t really a fan of spiders, there were certain levels that just made the hair on my arms stand up until it was over. It was terrible and a thrill at the same time. The good news here is that so far, the stealth and shooting mechanics have been improved tenfold. Your watch has a light/dark meter, fully letting the player know when they’re visible or out of sight in darkness. It’s a simple system but one that works wonders. Enemies act normally so stealth killing one person will no longer alert the entire room unless you’re careless. The stealth system is so improved that the game practically begs you to go stealth offering many different paths to clear a room and also providing tools to the player to remain undetected. NPCs do react to odd behavior as well, so taking a guy out in the middle of a speech or interacting with another NPC will raise suspicions. 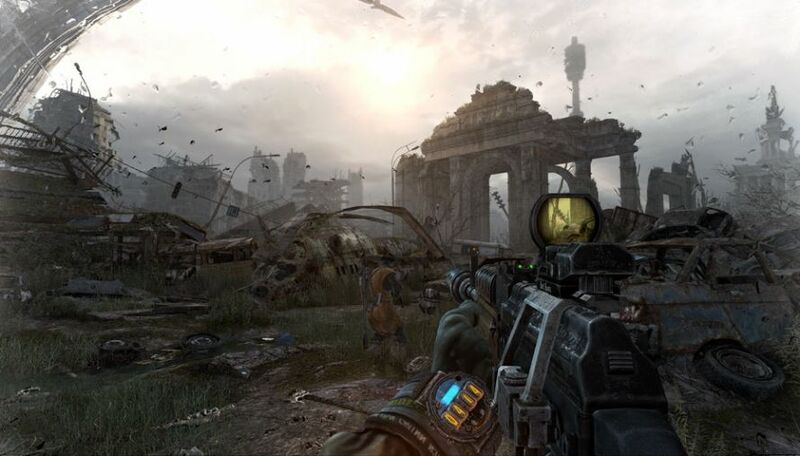 Want even more Metro: Last Light goodness? Check out my video posts here. In case stealth isn’t for you, you’re more than welcome to go in guns blazing. No penalties for doing so either. There seem to be a set base of guns from shotguns to SMGs to rifles. To make them feel different, guns can be customized and you’ll tend to find different combinations from dead bodies, shops, or guards you took out. For what it’s worth, bullets seem to be everywhere, so I never felt the strain of low resources, which I kind of expected. Perhaps on Ranger Mode or the hard difficulty setting, resources are more scarce. Originally I thought, the experience would be more open, being able to backtrack and explore areas at will. Unfortunately this isn’t the case as the game is broken up into chapters and is a more linear experience. Overall though, I don’t view that as a detriment because I find the gameplay engaging and fun. The good news is you can return to completed chapters through menus so it’s not a huge deal. One thing that I wish was handled a bit better is how the game doesn’t give you much direction to go in. Yes, the game is fairly linear, but certain levels are open enough that it’s quite easy to get lost or go around in a complete circle. I’m thinking that they didn’t add in a hand holding element like a navigation arrow in fear that it would break that strong sense of immersion I spoke about earlier. They may well be correct on that, but certain levels can be tricky to navigate as you’re just not quite sure where to go. I’ve seen a few glitches and oddities as well, but nothing anywhere near game breaking. I’m seeing mostly cosmetic things like enemies getting stuck in geometry or falling through parts of the map a little. For example, on the surface, I saw a watchman fall halfway through a plane’s wing. He seemed to be stuck in the running animation and completely unable to move. I should also say, I don’t see these things quite often and so far it’s been fairly issue free which is great. So far, I’m really enjoying my time with Metro: Last Light. It’s a unique shooter that relies heavily on atmosphere to get it’s message across. The story is also pretty engaging at this point so I’m hoping that keeps up right to the end. This entry was posted in Opinion and tagged games, Opinion, PC, PS3, Xbox. Bookmark the permalink.